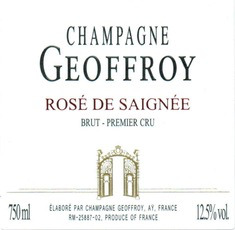 Sparkling Geoffroy Champagne Premier Cru Brut Rose de Saignee - Royal Wine Merchants - Happy to Offer! Jean-Baptiste Geoffroy, who has 14 hectares in the Vallée de la Marne, is the fifth generation in his family to grow grapes in the region. Light, bright pink. Spicy red berries, potpourri and smoky minerals on the highly perfumed nose. The palate offers sappy raspberry and musky cherry pit flavors that show a refreshingly bitter edge. The spicy quality comes back on the finish, which clings with excellent tenacity and focus.